Gregory Johnson has a passion for the kingdom of God. He desires to see the church truly live according to kingdom principles. But as stated on the back cover of his book, The Kingdom According to Jesus, “Church today is not always what Christ intended it to be.” I could not agree more with his premise, and Greg has done a great job of fleshing it out in a number of specific areas. Indeed, this book is full of Scripture. Rather than just picking individual verses out of context, Johnson has included whole passages, mostly from the Gospels, to show the full picture of Jesus demonstrating the kingdom. The English Standard Version is used throughout. Chapters 2–5 each highlight a character trait of kingdom living. The traits covered are love, grace, peace, and life. In each case, Greg takes a biblical approach to defining them, demonstrated by the life of Jesus and supported with recent examples. Chapters 6–9 similarly cover traits of the kingdom itself. Johnson went through the ideas of race equality, gender equality, health equality, and economic equality. He again supported his tenets with many passages from the Gospels as well as illustrations from his own life and the lives of others. The apostle Paul taught that women were to be silent in the church and could not hold some leadership positions. … I love the apostle Paul, and I believe his writings are inspired of God. He is one of my heroes of the faith, but I must take my understanding of his teachings within the boundaries of the teachings and actions of Jesus. If Paul’s writings were indeed inspired, then his teachings are the teachings of Jesus, including the prohibition of women in leadership positions over men (1 Timothy 2:12). We simply cannot gloss over Paul’s instructions regarding this. However, there is a huge difference between leadership and ministry. I absolutely believe that women (along with all believers) are called to ministry. Women (and all believers) are to evangelize. Women (and all believers) are to serve in the church. But leadership over men, according to the inspired teaching of Paul, is reserved for men. On a more positive note, I enjoyed the next two chapters of the book much more than I expected I would. More often than not, Christian writings on the topics of health and economic equality venture directly into the political arena. Thankfully, rather than calling on the government to usher in the kingdom, Johnson called on believers to act upon our own individual responsibilities. Beloved, if God reveals a need to us and He has given us the ability to meet that need, it is His expectation that we do so. We don’t have to pray about it. The need is the call. God takes care of the needs of people through us. Greg wrapped up his book with the call to kingdom citizenship. He gave believers the important reminder that we are citizens of the kingdom, not of any one earthly nationality. And he concluded by asking nonbelievers to repent, believe, and follow Christ today. Though I did not always completely agree with Gregory Johnson’s conclusions, I thoroughly enjoyed reading his book. I loved the frequent use of Scripture. And I believe I have finished the book with a somewhat greater appreciation for the kingdom in which I serve. 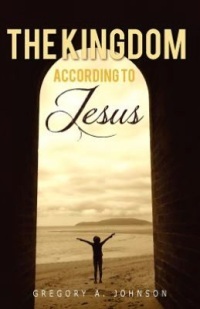 You can purchase The Kingdom According to Jesus as a paperback or as an eBook. Disclosure: Gregory Johnson was kind enough to send me a free copy of his book for the purpose of reviewing it. Thank you, Greg! Do We “Accept” or “Receive” the Word? Did Jonah Die in the Belly of the Whale? Why Don’t I Capitalize Divine Pronouns? What If Someone Never Hears the Gospel?